Have you ever been on vacation only to realize that everything is still moving way too fast? Often I find that I don't really start to slow down and relax until the third day of a trip, and so it was in the Everglades. Normally on trips, I use my camera to document as many experiences as possible. Part of the joy for me is in the photography itself, not to mention that it's nice to be able to look back on the trip in a tangible way sometimes. In the Everglades, I didn't even take out my camera until the second day on the water, and then only for a couple of pictures. By the third morning, I woke up relaxed and refreshed (finally, I might add) and immediately set to work using my camera. The morning quickly turned stormy as a powerful cold front, responsible for a major tornado outbreak in the Tennessee and Ohio valleys a couple of days earlier, was bearing down on south Florida. The good news? The wind would finally be at our backs, making paddling a joy instead of a painful chore. The bad news? Storms were forecasted. Thankfully, one storm cell went to our east, and another skirted off to the west, but we only received a five minute shower with occasional sprinkles the rest of the day. Arriving at our home for the next two nights, a campsite called Lostmans Five, we set about drying wet gear from the morning rains. After quickly pitching my tent, I grabbed the camera to document our camp and everyone else still putting up tents and organizing gear. Lostmans Five is a great little campsite that picks up any west or northwest breeze off of Lostmans Five bay. The campsite is a ground site, but a raised wooden platform covers the camping area since the low ground is prone to being muddy. An outhouse is perched on the end of the small dock, leaving one to wonder what happens when a hurricane comes through. Thankfully it wasn't hurricane season so we felt relatively safe using the facilities. Sitting on the end of the dock, I drank in the scenery. Occasionally birds would fly by across the bay and the water itself was mesmerizing. I could watch the gentle waves for hours, although exploring sounded pretty good as well. A beautiful sunset lit up the sky. The clouds had long since cleared out as the front was now well south of the area. We fixed something to eat, and appreciated the relative absence of mosquitoes from the area. Finally we all went to bed, thinking about paddling east into the wild Everglades the next morning. Fishing trips, while always anticipated, tend to fall into a predictable routine with predictable results. In general, I know what to expect when I fish Little River. Fish will be caught, including some nice for the Smokies fish of 10", 11", maybe even 12-14" and at least some of those will be browns although never as many as I would like. 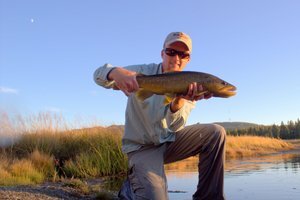 When I am fortunate fish will be caught on dry flies consistently although I tend to gravitate towards nymphs. Some trips, however, seem to take on a life of their own, complete with surprises that lurk around every bend in the stream and in each large bend pool. This past weekend I experience such a trip. Originally scheduled as a backpacking trip to #24, we bailed at the last minute because of the forecast which suggested that backpacking might be a little miserable. Intent on still visiting my beloved mountains, I decided that a car camping trip to Elkmont was in order. I headed up with minimal gear, still in a backpacking frame of mind, and prepared to fish wherever the wind blew me. When I was ready to fish, the wind was calm, but my instincts guided me up the Little River trail. This is probably my favorite place to fish in the Park. The likelihood of solitude and willing trout is always a great combination for an enjoyable day on the water. Wandering up the trail with the intent to put miles behind you is a torturous experience. There are so many great spots that beg for a fly. If you want that solitude and stupid fish though, it is normally best to not give in to the temptation to stop too soon. A brief stop in two nice pools to look for big browns afforded the opportunity to have a breather and even eat a bite. When I finally started fishing seriously, I was fairly certain that I didn't have another angler in front of me, at least not close to worry about fishing used water for the day. Moving slowly up the river, I quickly noticed that the fishing was not "normal." In other words, the fish weren't gobbling up nymphs like I am used to under standard conditions. After some experimenting as well as observing the insect activity, I settled on a dry/dropper rig with a parachute Adams and a bead head dropper. The action picked up substantially after that switch. Every once in awhile a fish would rise to the dry but most fish were eating the dropper. Several nice rainbows came to hand but mostly I didn't bother with the camera. Standard rainbow trout pictures did not interest me, but then something happened to change my mind. I was fishing a small flat adjacent to a much deeper run when a small fish ate the dropper. As it came closer I was shocked to see a brookie. This fish was easily 3 miles below where I would expect to find it. The scars on its back seemed like it may have had an encounter with a large brown trout recently. Regardless, I decided that it was time to take out the camera. 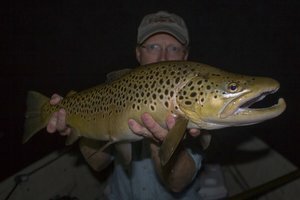 With the motivation to finish the Smokies slam, I was soon taking pictures of other trout, first a couple of nice rainbows and then a brown. Before long though I had another interesting event. 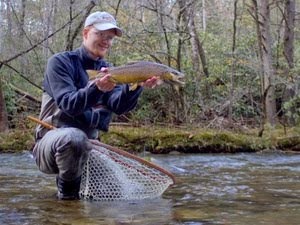 While I have experienced catching two fish at once before, specifically with white bass as well as with bluegills, I have never done it in the Smokies on trout before. When I hooked two rainbows, one on the dry and one on the dropper, I decided it was time for pictures again. Continuing up the stream, I took some time from fishing to take pictures of the beauty surrounding me. The banks of the stream were just beginning to wake from the winter slumber. High on the slopes above, the first leaves of the spring were making an appearance. Wild flowers bloomed along the trails. The banks of the stream were swept clean by the high waters of winter. The moss on the banks and rocks seemed to be an even more vivid green than normal. Despite the fun I was having taking pictures, the stream kept drawing me back. So I continued, up amongst and over the rocks, past steep rapids and deep runs, and the stream continued to yield its trout. Quill Gordons, Blue Quills, and even a March Brown or two started to hatch. Quill Gordon spinners also made an appearance. Brown Stoneflies as well as a few Little Yellow Stoneflies were popping out of the water as well. By the time I came to the deep pool, its surface was covered with bugs and trout were rising with abandon. 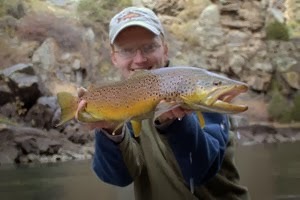 The first few casts yielded three fine trout, two rainbows and a brown. Everything was proceeding as is generally expected. Bugs were hatching, fish were eating, it was a fly fisherman's paradise. Things started to get weird when I noticed a rise far out in the middle of the pool. "A small rainbow," I thought. The cast landed perfectly two feet upstream of the fish and it ate very predictably. Things really got strange as I was fighting the rainbow. It began to act like it was not just running from me when a golden blur behind explained the poor rainbow's actions. 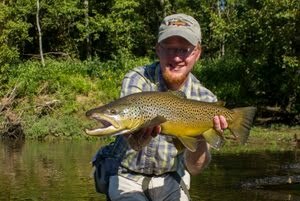 A big brown was closing for the kill and I realized I had the perfect opportunity to catch two fish on one fly. As the line became very heavy, my excitement level naturally increased dramatically. Something did not seem right though. The brown had too much leverage. When I caught another glimpse, the rainbow seemed to be gone and the brown was acting funny. Apparently, as the big brown closed for the kill, the trailing dropper snagged it right in the rear. I was now fighting a much larger fish, but was attached to the wrong end. A few short moments later, I got everything under control and decided that I might as well take a picture. I can appreciate big trout even if I don't count it as a caught fish. Not long after, I hiked out for the day. Stopping at a pool I had fished earlier, I finally tricked a nice rainbow that had eluded me the first time through. The fish slammed the parachute Adams. Back at camp, a heavy thunderstorm soon rolled in over the hills and I retreated to the relative safety of my tent to wait out the rain. Much later, I got up and prepared a quick supper before going to bed. I was tired and wanted to be ready for another fun day up the trail. Day two proceeded much the same as the first day with one important exception: the fish showed a definite preference for the dry. In fact, after fishing an hour or so, I finally just took off the dropper because I did not want to deal with the hassle of the extra tangles. Some sections of stream proved easier to fish than others. The water was still on the high side although definitely very fishable. Again, several pools had nice hatches coming off. Quill Gordons are still making an appearance in the mid elevation streams. Little Yellow Stoneflies are beginning to hatch as well. Wild flowers are blooming in the mountains and the dogwoods are just starting to make an appearance. This is a magical time of year in the mountains and should continue to produce excellent fishing for the next couple of months. On the trip to the Everglades, I was excited about my second taste of saltwater fishing. Knowing very little about fishing the salt, I decided that I wanted to catch snook. Why snook in particular? People have explained snook to me as the brown trout of the saltwater. That made sense and helped me understand what to do. Snook are ambush predators, lurking around mangrove roots and waiting for baitfish to come by. Brown trout lay just out of current and I figured snook might do the same. The second day of the trip dawned bright and promised to be very warm. We loaded the canoes and I strung the fly rod together, deciding to start with a white stealth bomber (tricked out with flash and rubber legs). I'm learning to really appreciate the noise making ability of this fly. Furthermore, it dives and swoons in the water, looking just like a struggling baitfish or something else that is edible. As we got under way with the day's paddle, I really wanted to get my first fish out of the way so I could relax. Not knowing what else to do, I started thinking in terms of brown trout. Paddling towards a creek that led to the next large bay, I noticed the tide had started moving in. The current was moving around a distinct point just ahead, creating a seam between fast and slow water. "Perfect," I thought and picked up the rod to cast. Amazingly, it only took about 5 casts to get that first fish. As I fought it closer to the boat I saw that it was a snook! Not a large fish, but a snook nonetheless. Two years ago, estimates say that 70% of the snook in the Glades area were killed by the extremely cold winter. I knew that meant the majority of the fish I did find would be smaller fish. Since I've never caught any, I didn't care if they were small or large. I was just happy to be catching fish. More fishing opportunities awaited deeper in the Everglades. But in the meantime we had a brutal paddle ahead to reach our next campsite. I put down the fly rod, not to take it up again until evening. Every year it gets more difficult and yet I still continue to start, and often finish, epic trips with no where near enough sleep. The trip to the Everglades was no exception. We planned well in advance that to maximize time on the water, we should leave Thursday afternoon as soon as school let out for break. Somehow, I usually end up driving on these long trips. So when my driving shift came up around 1:30 at night and I hadn't really slept on the way down yet, I figured I might as well get comfortable and settle in for the long haul. Hours and many miles later, I was cruising through the gradually awakening world southwest of Orlando. We had dropped a friend off there, and while it was slightly out of the way, we made it through early enough that it didn't really slow us down too much. The stress began to build as the sun climbed higher and higher though. The Everglades National Park has a thoroughly ridiculous policy that you can only reserve a campsite in person up to 24 hours in advance of your trip, and furthermore that you must reserve any site you plan on using. Thus, it is always a distinct possibility for visitors to the Park to arrive only to learn that your itinerary will NOT work. By the time we arrived at the Ranger Station, I was convinced that our trip would probably be in vain and we would not get our site. This was due to two reasons: first, because I was exhausted and probably not viewing the glass as half full, having been awake since the previous morning around 6:00 am, and secondly because we arrived around 1:30 in the afternoon. Most of the time this would be far too late during peak paddling season. Incredibly, despite our worries, our whole itinerary was totally open. The list was as follows: first night at Lopez River, second night at Darwin's Place, third and fourth nights at Lostman's Five, fifth night at New Turkey Key, and sixth night at Rabbit Key. The plan enabled us to experience a little bit of everything, or at least nearly everything, that the Everglades have to offer from remote backcountry bays to mangrove tunnels on Charlie Creek to big water paddling on large bays at the edge of the Gulf of Mexico and camping on beaches. I was so tired that I really didn't even think of getting out my camera until sometime during the second day. Suddenly it occured to me that it might be nice to document the trip and I started shooting as often as conditions allowed. My first shots were of the wide open bays on the upper end of the Wilderness Waterway as we paddled towards Darwin's Place campsite. Mangrove is on every horizon here. The next morning I remembered to shoot a few pictures of camp as well as the scenery around it. After a couple nights of good sleep, I was feeling much better and ready to really start enjoying the trip! While reviewing and reminiscing about the Everglades is high on my to do list, I am also very interested in the status of the local fisheries here in Tennessee. Lots of rain mean the tailwaters are all pushing lots of water and although I love heading to the Smokies, I didn't have a whole day to get out and explore. In the end I settled for a couple of hours at a local farm pond as a last opportunity for fun before break was over. This spot gets more than its fair share of pressure but the fishing for bluegill, crappie, and bass is still pretty decent. This time of year can be iffy though as water temperatures fluctuate, sometimes drastically, and the fish may or may not be on the feed. When I arrived I noticed one thing right off: the water was much clearer than I normally would expect at this lake. Not in just a nice clean water sense either, but in that icy clearness that cold water takes on. Thinking my efforts might be in vain, I still went ahead and tied on a #14 beadhead Simi Seal Leech. As long as I was there I was going to fish. Working along the shoreline in an shallower area that normally holds some nice bluegill, I settled into my normal routine of casting followed by a very slow twitch retrieve. Several casts produced nothing and it seemed my fears were on the verge of being confirmed: it was simply too early. Then I realized that in the cold water, the fly might need a little time to get deeper. The next cast I waited for 5 slow seconds as the bead dragged the fly deeper before beginning the same slow retrieve. Half way back to shore, I saw the end of the line twitch. Normally bluegill will hit hard enough that you don't have to wonder but not this one. It must have just barely touched the fly. A quick hookset confirmed that a fish was messing with my fly, and it was soon swimming about as bluegill will do, using its flat body to full advantage to feel much larger than it really was. Landing the fish, I quickly took a picture of the first spring bluegill and sent it back to grow some more. Several fish later I decided to explore. Several other stops produced fish as well. Heading back towards the car, I told my friend that I wanted to catch a crappie. There is a spot that usually holds some but a couple guys were fishing it. I set up nearby, close enough to have a shot but not so close that I crowded them any. For the first couple of casts I saw nothing. Then the third cast produced a follow from a nice little bluegill. "Slow down," I thought to myself. Letting the fly sink even more than normal, I began a slow steady retrieve. A tap on the end of the line brought the required hookset and I was soon staring in wonder at, of all things, a crappie. I was suprised, more because I don't really catch that many here, meaning I didn't really believe it would happen. Happily, I got a picture of my catch and was soon headed home, happy to have got a pleasant hour in on the water. Another epic visit to the Florida Everglades is now history. The trip was a lot of fun for many reasons including the paddling, lots of wildlife, and yes, even a little fishing. Things like camping on the beach were definitely a huge plus as well. I have well over 10 gigabytes of just my own pictures and video to go over, not to mention similar quantities from my friends as well. Over the next few days I'll be posting pictures, stories, and other tidbits from the trip.